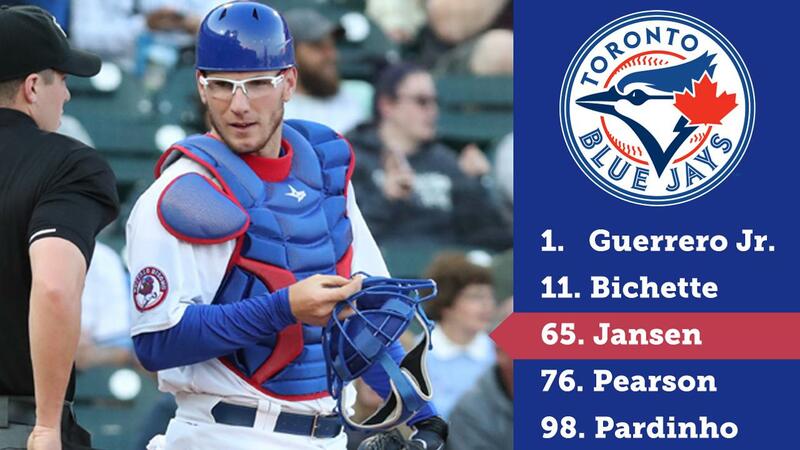 The present is bright, and the future is even brighter, for the Buffalo Bisons and the Toronto Blue Jays farm system. The Blue Jays have 254 'Prospect Points,' determined by counting backwards from 100 to 1 (as the top prospect in baseball, Guerrero Jr. accounts for 100 points. San Diego's shortstop Fernando Tatis Jr. gets 99 point as the #2 prospect, and so on). Infielder Bo Bichette cracked the top 15 as the 11th best prospect in baseball, adding 90 points to the Blue Jays' tally. Bisons catcher Danny Jansen is #65 after a stellar 2018 that earned him International League midseason and postseason All-Star honors as well as an appearance in the 2018 MLB's Future's Game -in which he homered. The Bisons team MVP last year, Jansen hit .275 with 21 doubles, 12 home runs, 58 RBI and a .390 on-base percentage before receiving his first big league promotion in August. While much is known about Guerrero Jr., Bichette and Jansen, the Blue Jays have some promising arms coming as well with potential stops in Buffalo. Nate Pearson (#76) was the second of Toronto's two first round picks in 2018 and has the best fastball (topping out at 104 mph!!! in the Fall League) and slider in the system. The righty lasted just 1.2 innings in his first pro season, however, suffering a fractured forearm after being struck with a line drive while with Dunedin. Eric Pardinho (#98), one of the top international prospects in 2017-2018 after a stellar amateur career in Brazil, was 4-3 with a 2.88 ERA in 11 starts with rookie Bluefield of the Appalachian League last season. With a plus-curveball and a developing slider, he struck out 64 and allowed only 37 hits in 50 inning last season.